In the session, I took a few audience-submitted vizzes and “pimped” them, just as Xzibit would do on the MTV classic, Pimp My Ride. We added a lot of interactivity, custom visuals, embedded content, and other things to make the visualizations more engaging and entertaining. If you want to see what all I did during the presentation check out the follow-up. I only really have one chart in this viz: a bar chart. Tableau automatically creates a nice clean set of blue bars for me but we are going for a look that isn’t default here. I changed the color of the bars to the chocolate color I already discussed. Another subtle thing I did is increase the size of the bars. That’s why they appear a little closer together than normal. I did this because instead of showing the headers for the rows, I chose to add the breed name and score to the label and I wanted the bars to have enough room to display the label inside. I made the labels inside the bars by aligning them to the left. Then, I hid the original header by right clicking on the pill for breeds and unchecking “Show Header”. If you are familiar with my work, you know that I almost always make some kind of custom banner for the top of the dashboard. This is a super easy way to get a custom look to your viz. My usual strategy is to pick a custom font (I like using dafont.com for this) that matches the theme/style of the dashboard and use Illustrator to make a banner. But really, fancy graphic software isn’t required for this. I know lots of heavy-hitters in the dataviz world that make their custom images in MS Paint or even Powerpoint. In this case, I kept it pretty simple. I used a font I liked, added some paw prints, and made it match the color scheme I already had going. One of my biggest pet peeves are unformatted tooltips. The default tooltips add data in whatever they were added to the viz in, so they often come out pretty disorganized and hard to read. Cleaning them up to be more friendly to human eyes is one of the best things you can do design-wise and enhances the user experience of the viz. In my opinion, no Tableau dashboard is complete without a little interaction. It’s what sets Tableau Public apart from all the different static tools you can use. Thinking of a way for your end viewer to interact with the viz, whether that’s using quickfilters, parameters, or dashboard actions, can add a lot to your viz. In this case, I wanted this dashboard to be very personal, since it’s about finding the right breed for you. 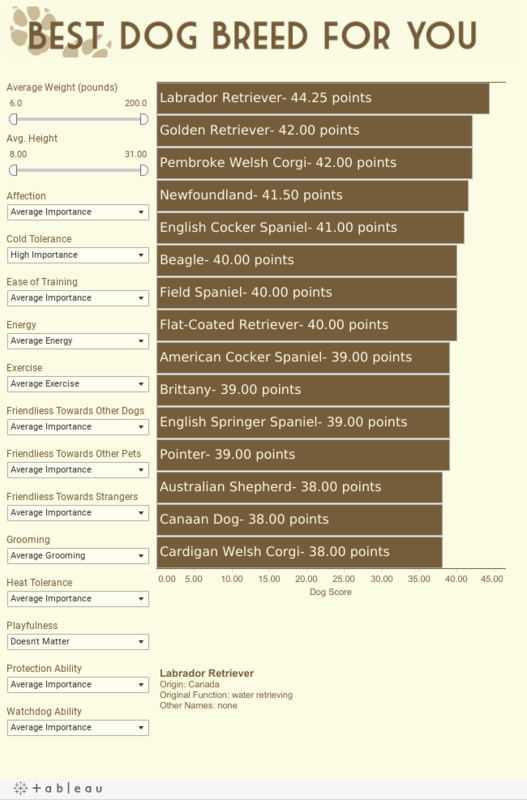 I added parameters for all of the factors contributing to a dog’s score so that the user could input what is important to them. I also added a dashboard action to open up a URL with a picture of the dog.